As a pre-kindergartener at Today’s Life, your child participates in joyful interactions that support all areas of development and experiences social situations that foster teamwork. The process of learning to read and write is a huge priority for us. In addition to new experiences, each pre-k child has ample opportunity throughout the day to discover the connections between letters and sounds. Our classroom environment is designed specifically for children who are ages four and five. 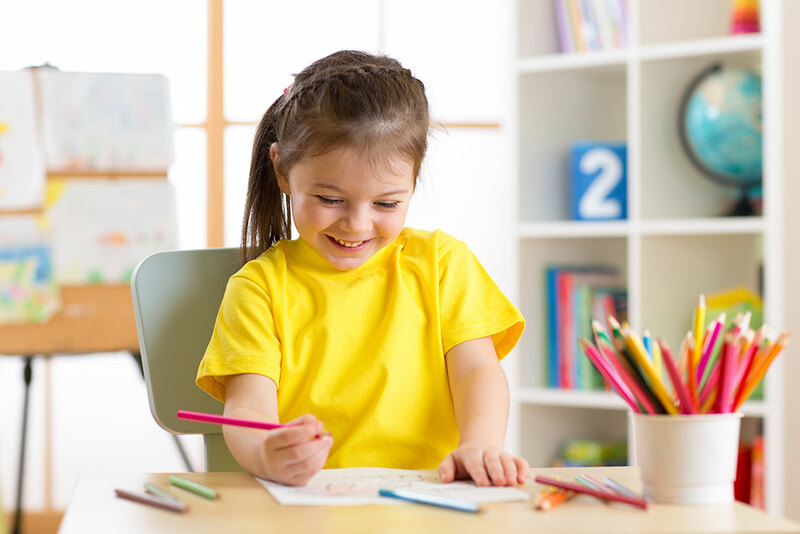 In our learning environment, we will provide your child with numerous opportunities to use his or her imagination, be creative, and learn successfully. It’s important for children to experience new things at an early age. Because of this, our classroom is ever-changing, allowing your child to interact with new toys and hands-on learning materials. We incorporate a weekly theme into our lesson plans, allowing your child to experiment with new content. In addition to exploring the classroom environment, we employ a certain amount of autonomy, allowing children to use high-level thinking skills and take control of how they spend their day. We have a daily group time where we review our colors, numbers, shapes, and the alphabet. We talk to the children about the weather, days of the week, months of the year, seasons, sight words, and our weekly theme. We often plan our art projects off of our weekly theme and do art in small groups. Our teachers spend time getting to know each child and how he or she learns. At Today’s Life, we understand that not every child learns the same as the next, and we want each child to reach his or her full potential. We like to work in small groups based on age and similar developmental goals. In these groups, your child will be exposed to reading, writing, science, geography, math, and social studies. As the children blossom academically, we also introduce them to technology that will prepare them for an elementary school classroom setting. We provide computers, tablets, and robotic cubelets for their exploration. At Today’s Life, our child care providers strive to create a nurturing environment where children are taught good behavior, to use nice words, and to respect each other. We understand the importance of caring for your child not only physically, but also socially and emotionally. Kindergarten readiness is more than just reaching a certain age. Today’s Life graduates transition to kindergarten ready to learn, grow, and thrive as confident and independent lovers of learning. We take the health and safety of your child very seriously. In our classrooms, there is a constant ratio of one teacher for every 10 children, to ensure that there is always someone watching. In addition to maintaining a safe ratio, all of our teachers are thoroughly vetted and must pass a background check every two years. To maximize the health and safety of your child, we also require that our teachers are trained in first aid every three years and in CPR every two years. As your child grows, he or she will develop more independence. In our pre-K program, our teachers are always ready to aid your child in developing healthy self-help skills. During the nap time, we also take safe-sleep precautions. Health and sanitation are very important to us. To avoid the spread of germs, and to keep the classroom and play areas as clean as possible, we sanitize and wash our toys and equipment several times throughout the day. Today’s Life provides a healthy morning snack, a hot lunch, and an afternoon snack every day. As a parent, there is nothing more worrisome than putting your child’s care in the hands of another. At Today’s Life, we try to ease your worries by providing you with daily reports on what your child did that day and how he or she behaved. In addition to your daily report, you will also have the option to speak one-on-one with our teachers twice a year at our parent/teacher conferences. Our enrichment program is an excellent way for your child to explore new activities outside of the classroom setting. Between Spanish, music, and more, you can have peace of mind knowing that your child is having a well-rounded experience at Today’s Life. Come visit us today! With locations in Eden Prairie and Brooklyn Park, we serve the entire Minneapolis area, including Chanhassen, Minnetonka, Bloomington, Shorewood, Shakopee, and Savage.